Well the sun has finally decided to grace us with its presence here in the UK, sometimes its not there for very long but nonetheless it seems to be making an appearance more reguarly- yay! With a new season comes a rummage in my make up/ beauty stash for products that I like to use at this time of year. There are a fair few I have resurrected so I've split them into categories and will do a few posts on how I've switched up my make up bag. I'm gonna start with nails because this is the thing I always get most excited about in the summer- turquoises, mint greens, pastels, pinks, brights- you name it I'll be wearing it on my fingers and toes. 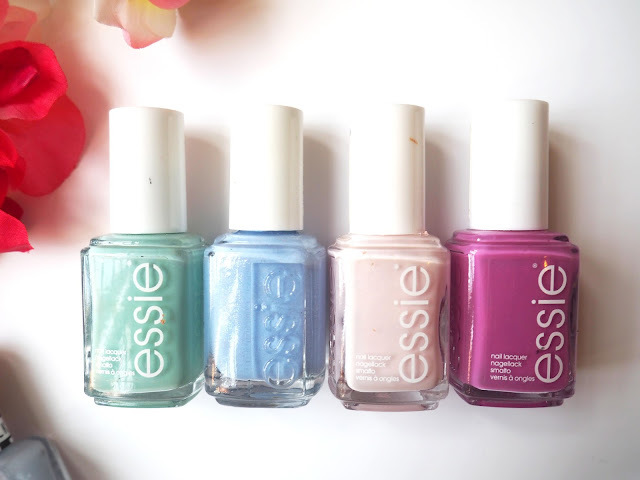 My top picks are from two brands that do nails like no other- Barry M and my beloved Essie. Lets start with Barry M- there were loads of these ones I could have mentioned but I've restrained myself and picked out a few that I particularly like. Dragon Fruit (Gelly Hi Shine)- a bright Barbie pink. It's super fun and cute, I wouldn't usually opt for this kind of shade but every now and again I just need a bubblegum shade on my nails. 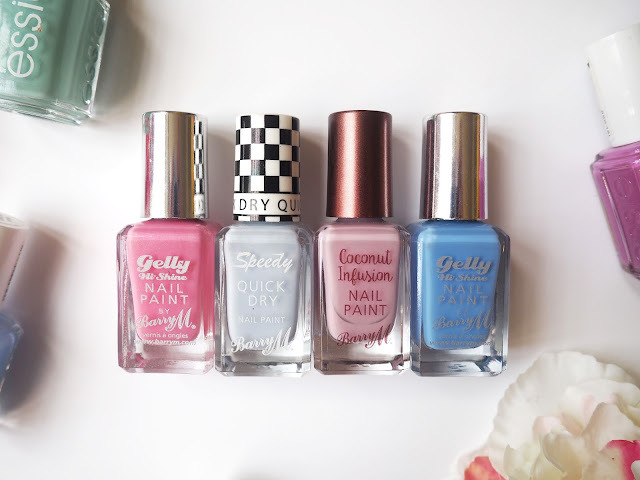 Eat My Dust (Speedy Quick Dry)- I love a blue nail polish at all times of year but in the Spring and Summer I like them even more this pastel shade being an example of why! Surfboard (Coconut Infusion)- first of all, how cool is the name of this? Not that I would ever surf as I can't swim but you know what I mean. Blueberry (Gelly Hi Shine)- Yep, blue again. This one is a brighter shade that looks very eye catching. Mint Candy Apple- a very famous shade, the perfect minty shade that looks amazing with a tan....not that I ever have one! Bikini So Teeny- the cutest name and the cutest shade, a pale baby blue with lots of shimmer running through it, I was obsessed with this last summer. Fiji- another famous shade from our friends at Essie, a very pale pink, in fact it sometimes looks almost white. Splash Of Grenadine- such a pretty purple shade, its also one of those shades that quite unique, you don't see many others like it. 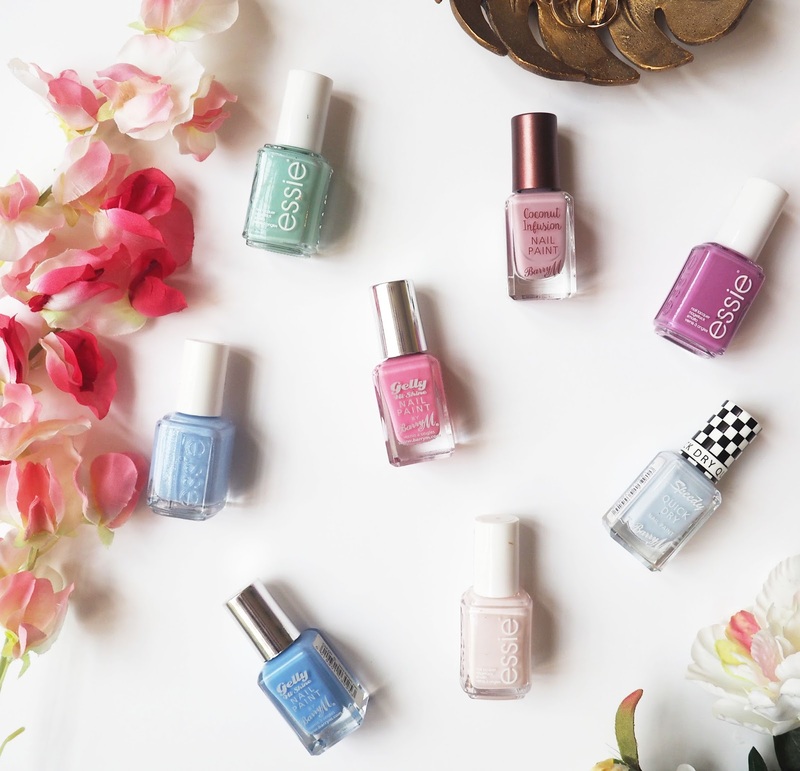 Which nail polishes do you like wearing in the warmer months?